JB Hi-Fi has the best deals on TVs, Cameras, GPS, Notebooks, iPads, Tablets, Phones, Gaming Consoles, Home Entertainment Systems and whitegoods at JB HOME…. it’s the card that everybody wants, as they never expire! JB Hi-Fi Gift Cards do not expire. JB Hi-Fi gift cards can be used at JB Hi-Fi stores in Australia or online at www.jbhifi.com.au. For online purchases simply enter the card number and PIN number displayed on the eGift Card. For in store purchases print out the eGift Card and take it into any of our stores. JB Hi-Fi will not be liable for lost or stolen gift cards. This gift card cannot be exchanged for cash. 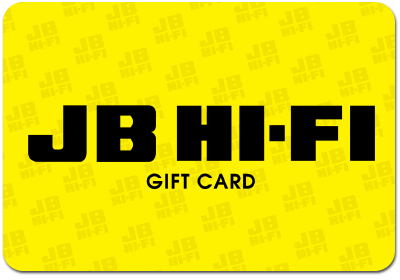 For full Terms and Conditions please visit https://www.jbhifi.com.au/Gift-Cards/Gift-Card-Terms-and-Conditions/ Gift Card Services powered by Vii.